Some homeowners are hesitant to sell to a professional home buyer because they know the offer will be lower than what they might fetch if they got lucky with a traditional buyer. When you’ve had your fill of dealing with the traditional market or you can’t stand the waiting game anymore, a professional cash home buyer might feel a little bit like your hero. No matter how you sell, you want to know you’re getting the best deal possible. Nobody likes to walk away feeling like they missed an opportunity or they were lowballed. Even though a professional home buyer’s offer may not be as high as the actual appraised value of your home, there are still a few things you can do to make sure you get the highest amount possible. Think about everything that might need to be changed. Do you have structural defects that need to be fixed? What about an ongoing water damage situation due to a leaky pipe? Your home might need some expensive work before it’s attractive to a buyer that wants to live in it. A professional home buyer is going to see these things and consider them before an offer is made. 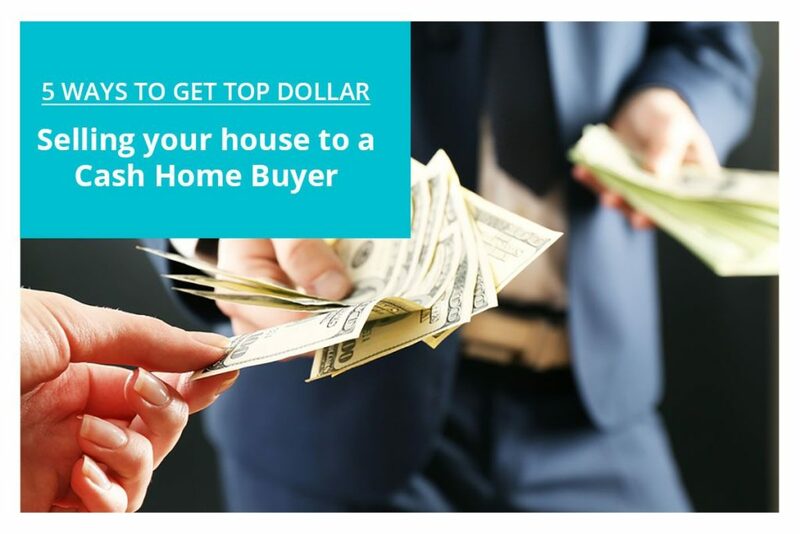 Top dollar may not be as high as you think if the cash buyer has a lot of work to do. In the end, a cash buyer might be saving you time and money. You won’t have to spend your own cash to fix the problem or wait for the repairs to be completed. This is something important to keep in mind when you receive an offer for your property. The better condition your home is in, the better the offer will be. Since professional home buyers are purchasing your home as an investment, they need that investment to be profitable. If there are things you can do that would save a professional home buyer time and money, the offer they give you will reflect that. One of the easiest things you can do is haul off your own junk. Not only will this make the situation simpler for a cash buyer, it will also allow the buyer to evaluate your home with ease. When the obstacles are out of the way, the buyer can make a clear assessment of your property. Things like painting may not be a big deal, and repairing appliances that an investor intends to replace anyway won’t prove to be worthwhile in the end. Making sure the home is clean and the actual structure of the home is secure are what’s most important. If a professional home buyer has to guess something, they aren’t going to take a gamble and bet high. If you don’t know how old your roof is, if the HVAC has been replaced or if your wiring fulfills current standards, a cash buyer might assume the worst. Be forthcoming – it won’t hurt. Since they’re going to guess low when verifiable information isn’t available to them, it’s good practice to be honest. Things might be better than the cash buyer expects, and you can benefit from that. A cash buyer will want to tour your home. Make it easy. Take the buyer around, and show them everything. Make sure your home is clean and clear for navigation, and send your pets away for the day. Have all of the documents related to your home on hand, including summaries and bills of any recent repair work or renovations that you’ve done. When you’re a part of the process, you can see to it that nothing is overlooked. The buyer might not know that your attic has been converted into a loft unless you take them up there. Be active and involved throughout every step of the process. You’ll be there to fill in blanks you might not have otherwise known existed. You don’t plan to sell your house and live out in the wilderness. You’re looking to buy a new home or move into an apartment and use the rest of the money for something else. How much do you need to profit in order to be able to do that? A professional home buyer may not be able to give you all of that, but at the very least, they can try their best to get you close. Another time when needs are important is when you’re selling your home to a professional home buyer in order to avoid a foreclosure. When that happens, you’re going to need a specific amount. You have to satisfy the bank in order to make that sale quickly and avoid the impending auction. When that happens, experienced professional home buyers will know what to do. They can talk to your lender in order to come up with a number that will shut the problem down. Since you generally can’t profit off the sale of a foreclosure home, top dollar in this scenario would be whatever the lender needs. The issue gets handled, and foreclosure won’t be floating on your credit history for the next seven years. You can get yourself back on track much sooner. Any accepted offer is the best case scenario. Should You Sell Your House to a Cash Home Buyer? If you’re comfortable with the offer you receive and you understand how that number came about, selling to a professional home buyer might be the best solution for you. A great professional home buyer will explain the offer and answer any questions you have in order to provide you with the peace of mind you deserve. When the regular market isn’t an option, professional home buyers are a great alternative. It’s possible to get a very fair offer on your property and genuinely feel good on the day the sale closes. The process is different, but in many situations, it’s better. Southern California Home Buyers would like to show you just how easy the process can be. Simply fill out the form you see below to get started and one of our real estate professionals will be in touch to discuss the sale of your home.